Shachar, A. (Ed. ), Bauboeck, R. (Ed. ), Bloemraad, I. (Ed. ), & Vink, M. (2017). 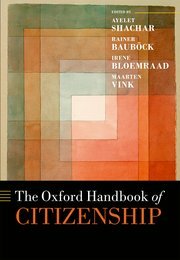 The Oxford handbook of citizenship. Oxford:Oxford University Press. Nauta, W. W., & Lee, T. J. (2017). South Korean civic actors in Rwanda: Promoting rural development and an emerging civil society in contexts controlled by the state. In A. Graff, & A. Hashim (Eds. ), African-Asian Encounters: new cooperations and dependencies (pp. 183-215). Leiden: Amsterdam University Press.